Threading, according to Wikipedia, is “an ancient method of hair removal originating in the East; where practitioners use a pure, thin, twisted cotton thread which is rolled over usually untidy hairlines, moustaches and other areas of unwanted hair, plucking the hair at follicle level. Unlike tweezing, where single hairs are pulled out one at a time, threading can remove an entire row of hair, resulting in a straighter line. As a larger area of hair is removed at once, however it can be relatively painful”. Anyway, I’ve read a small feature of Browhaus Thailand in a magazine or a newspaper and saw the services they offer, threading was one of them. So it got me excited to go and have my eyebrows groomed there. So, I went last Sunday and I was surprised that it’s not a big of a place in terms of floor area. It shares shop with a waxing center (which I didn’t get the name, sorry. It’s called strip, something). I was asked to fill out a form about my contact details, etc since it was my first time there. I was the only client so it was really quiet. The area where I was seated for my threading is pretty small but not really cramped, it was separated from other cubicles by chicken coop wire “walls” decorated with their unique “brow” photos. I sat on a reclined chair and the “threading” lady (I didn’t get her name too) placed a cover on my top and legs. Before threading began, an antiseptic (perhaps) was applied on my brows; it didn’t tingle at all. Then the threading began, it was what I remember it to be, not painful! I was even proud that I didn’t feel pain for I really have high tolerance for pain. I was told then to hold my eyelids firmly with my fingers, the lady was to groom the lower part of my eyebrows. And boy, was that painful! Since that part of the skin is soft and tender, there was more pain felt as the hair is pulled. I’m not exaggerating and being a drama queen here but tears literally roll down my face when my eyes are closed. Oh, all for vanity and good grooming! The brave me was already dreading the same painful process to be repeated on my other eye. The nice lady tweezed and trimmed a bit of my brows, too. Tweezing made my eyebrows more sore. Whew! After the whole process of threading, tweezing and trimming, I was shown how my brows looked like. I was satisfied to see my clean and well-shaped brows which is not too bushy and not too thin either. Then some eye cream was applied and that capped off my first browhaus experience. The whole process lasted more or less than 20minutes only. Besides the pain, which is expected, I was satisfied with the threading service I availed of last week. I’m definitely coming back again and I want to try the waxing services too. Threading costs THB450 while Tweezing and Threading costs THB600. Tweezing is THB500. Browhaus Thailand offers a variety of other services including coloring the eyebrows, lash extension, lash curl up, and more. 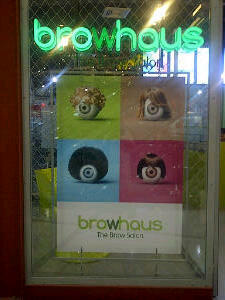 You can visit their facebook page: http://www.facebook.com/browhaus.th for more information.